Sometimes, you might have sent out an email with high hopes, and it’s all good when that anticipated response gets into your inbox. But on many occasions, you wait for the response, clueless about whether the email was actually read, or did it just go unnoticed among hundreds of other messages. So, you’re not quite sure whether sending a follow-up mail would be worthwhile or not. Email tracking is not a new concept. Marketers and advertisers usually track their emails in order to profile potential customers. Services like Aweber, MailChimp, etc., have built-in tools for marketers to track and analyse their customers’ email interaction trends. But personal email services (like Gmail, Yahoo, Outlook, etc.) don’t have any inherent feature for tracking emails. In this article, we’re going to explore a few of the email tracking solutions for personal email services, which notify you of when, where, or for how long your mail has been opened by the recipient, if at all. These solutions may also track opening of links or attachments. Email tracking is usually accomplished with web beacons, which typically are tiny, transparent images, embedded within the email content. When the email is opened, metrics like time, location, etc., can be tracked and recorded. Similarly, distinct tracking codes are also embedded in the message body for tracking link or attachment opening actions. Email tracking apps either use extensions (plugin) or SMTP relay to embed tracking codes within emails. BananaTag is a useful email tracking app, which can provide several insights on recipient-side email interactions. You need to sign up for a BananaTag account and link your existing email address in order to use it. The service presents email analytics in the form of web trends, such as number of opened emails, number of links clicked, percentage of mails accessed via desktop vs. mobile, percentage of unique opens, and more. All these metrics are available in your BananaTag Dashboard. BananaTag integrates with Gmail and supports Outlook Email Client via plugin. In Gmail (Web), you can select the Track Email checkbox at the bottom of the Compose Email window in order to start tracking your mails. In Outlook, ensure that the Track Email button is enabled in the New Message window before sending out the mail. You can also use BananaTag with other email clients, including Apple Mail, iOS Mail and Android Email apps by configuring the SMTP server settings for outgoing mails (SMTP Relay). Once you set up BananaTag’s SMTP settings on your email client, all mails sent from it will automatically be tracked. If you use a different webmail service other than Gmail, your email service provider may not allow you to modify SMTP settings. In such a case, can still track your sent items using BananaTag with the legacy .btag.it tracking method. Just append .btag.it to the recipient’s email address (for example, if you want to track an email sent to jack9@yahoo.com, type it as jack9@yahoo.com.btag.it), and you’re good to go. The email will be tracked and all related analytics will be made available on your BananaTag Dashboard. The service is available in both free and paid plans. The Free plan is limited to tracking up to 5 emails per day, while the Pro plan supports tracking up to 100 emails per day and includes additional features as well. The Pro plan is available at $10.00 per month. There are also plans available for Teams and Internal Comms, which are meant for small businesses and enterprises. MailTrack.io is an email tracking service similar to BananaTag, which integrates within your Gmail inbox and displays read receipts adjacent to each of your tracked mails. The read receipt indications are similar to those used in popular messaging apps — single tick for Sent and double tick for Read. The service also includes a Chrome Extension that provides real time tracking notifications, and introduces the “Enable Tracking” button in the Compose Email window. You also get a personal Dashboard where you get the tracking details (e.g., time of opening particular email, of opening links within email, etc.). If you send an email to a group of people, MailTrack can also identify who among the group has read it, as long as both you and your recipients are MailTrack.io users. MailTrack offers two different pricing plans. The free version offers limited tracking features for an unlimited number of emails. Additionally, you also need to send out every tracked email with a custom MailTrack signature. In order to remove the signature and enable full support of all features, you need to upgrade to the paid plan, which costs $4.13 per month. Ever since Dropbox discontinued the MailBox app, the App Store had been missing a decent replacement. CloudMagic has done an impressive job at making up for its loss. Recently, CloudMagic reintroduced their email client for iOS, Android and Mac as Newton Mail, with a host of powerful features, named Superchargers. Superchargers include Snooze, Sender Profile, Send Later, Undo Send, and many more handy emailing features. Among the many unique “Superchargers” offered by Newton Mail, Read Receipts deserve a mention here. Email tracking on mobile hasn’t been as good an experience as on the Desktop; Newton Mail changes that. Emails appear in the form of conversation threads. And when you send an email using Newton, it is automatically enabled for tracking. As soon as it’s opened by the receiver, you will see blue ticks adjacent to it. Tapping on the blue ticks reveals details about the time and location of the receiver when they opened it. Newton Mail can also send push notifications when your emails are read. You can customize Read Receipts and Notifications from Newton’s Settings. Most email tracking solutions available today work mostly with Gmail on Chrome and don’t support mobile. 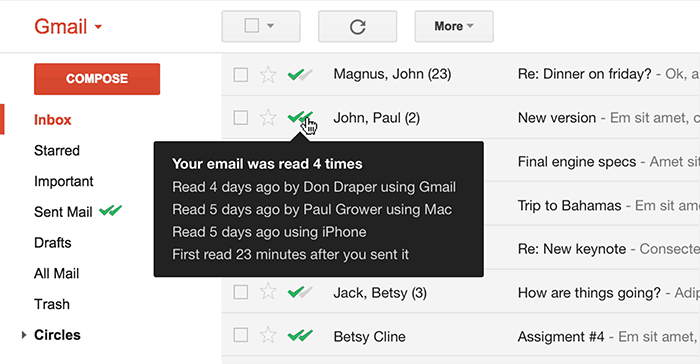 Newton’s Read Receipts works on both desktop and mobile, for all email accounts – Gmail, Exchange, Yahoo Mail, Hotmail/Outlook, iCloud, Google Apps, Office 365 and all IMAP accounts. The basic emailing features of Newton Mail are available for free, but you’d need to sign up for a yearly subscription of $49.99 to continue using the “Superchargers” (which includes Read Receipts, among other cool features), after an initial 14 day free trial. Newton Mail is available on iOS, Android, macOS / OS X; a Windows version is also in the works. These are some of the best known email tracking apps for different platforms. There is also another email tracking service that provides a similar set of features, but is completely free, called GetNotify. If you know of any better email tracking service meant for tracking your personal email, feel free to discuss in the comments below. And if you’re looking for something to block email tracking, check out this article.